Living in a technologically driven age, it is no surprise to see Apple in the driver’s seat. It is an age where simply placing an “i” in front of any word could only mean one thing, innovation. Sanho Corporation has been working with Apple for years to create products such as HyperJuice, an external battery and car charger for the MacBook, and the HyperDrive, a portable photo storage device. This time, Sanho Corporation has partnered with PhotoFast Company Limited to create the iFlashDrive and is currently distributing it exclusively to the United States and United Kingdom. So, why is it called the iFlashDrive anyway? The answer is simple. It is the only way it could be compatible with the iPhone, iPad and iPod as well as support two-way data transfers between computers and different iDevices. Tongue-twistedly co-branded the HyperDrive/PhotoFast iFlashDrive, this product is available in 8GB, 16GB and 32GB. It has a USB connector and offers the same functionalities as any other flash drive on the market. With that said, what separates the iFlashDrive apart from the rest of its fellow USB drives? The answer sits on the other side of the device in an Apple-approved-30-pin dock connector that works with the iPhone, iPad and iPod to perform two-way data transfer just the way a USB flash drive works with a computer. •	Open any file natively supported by the iDevices. •	Open files with third-party apps. •	Have built-in music player, voice and text editor. •	Import photos and videos from the iDevice library. •	Back-up and restore iDevice contact list. •	Send out files in email attachments. 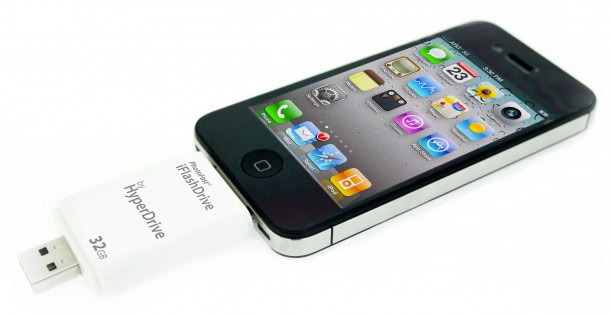 At $99.95 for 8GB, $149.95 for 16GB and $199.95 for 32GB, the iFlashDrive is far from “iNExpensive”. So far, during the iFlashDrive’s pre-order debut, there are already mixed reviews. The main question that has been raised is whether or not the new iFlashDrive is, in fact, worth the expense. Is it worth the $200.00 to pre-order a device that may come down in price by 20% a year from now? Is the Android equally as capable, if not more according to some Androidians, for less the cost? This entry was posted in Apple, Articles, iFlashDrive, iPad, iPad HyperDrive, iPhone and tagged HyperDrive iFlashDrive, iFlashDrive, PhotoFast Company Limited, PhotoFast iFlashDrive, PhotoFast iFlashDrive now available to pre-order, Sanho Corporation. Bookmark the permalink.